I'm thinking about adding a new color for Spring in the master bedroom and bath. I want to use turquoise with the taupe and cream that I already have there. ...Hmmm. I can't decide...I like this shade, but maybe it should be a bit softer. How's this for brown stuff on a brown tray on a brown table?...and just a smidge of green. This one's on the living room coffee table. Definitely woodland. 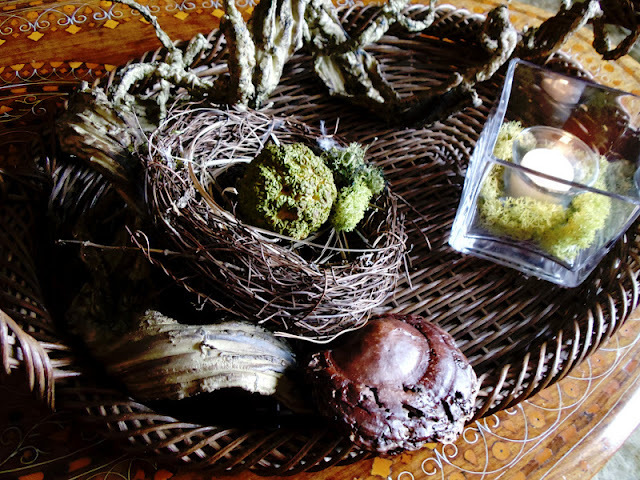 Oh, the little shriveled ball in the bird's nest is a dried hedge apple from my hedge apple fever post... and a bit of moss. It's amazing how much the hedge apple shrank. I really like the reindeer moss...so much color and texture. 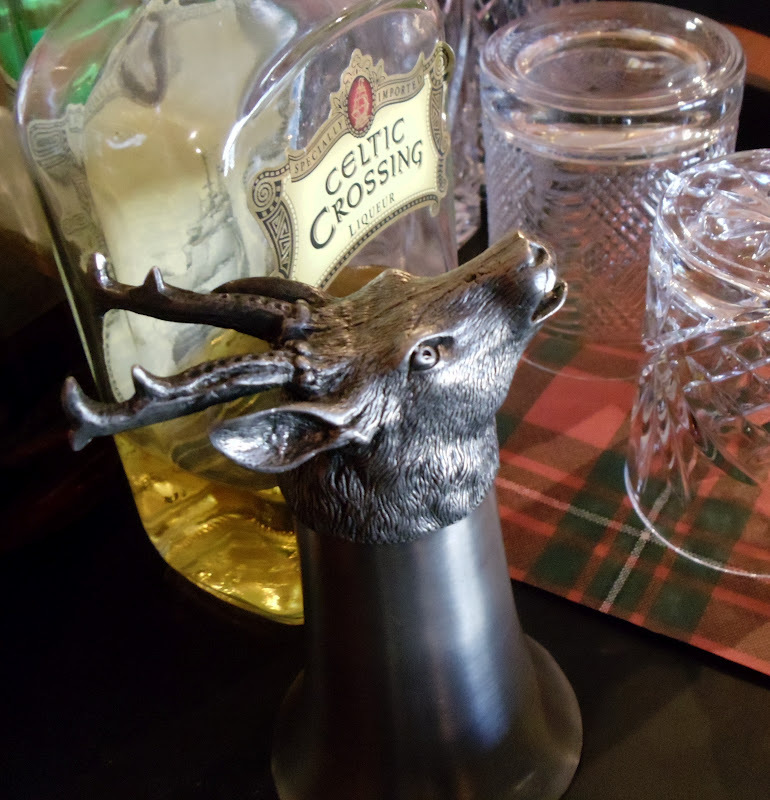 ...but the stag's head stirrup cup is waiting, if you'd like a drink. Here's the last tray with a few chocolates just waiting for you. Would you like tea or coffee with them? They're really yummy. It's supposed to be cold tonight, so y'all take care, stay warm and have a great weekend. 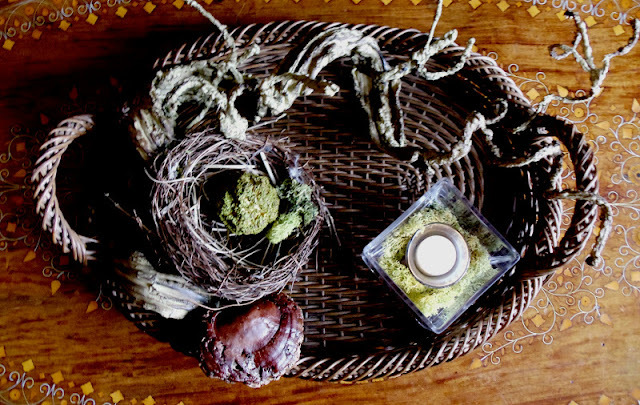 All of your vignettes in your trays look pretty and functional too. I really love the one on the coffee table with all of it's texture and dark colors. I love your bar set-up too. It has a Ralph Lauren look to it. I noticed that the temps have been dropping over the last few days and tonight is supposed to be very windy and much colder. Time to get that fireplace started! Babs I thought the first tray was my favorite until I saw the second one! Heck I love them all and your pretty vignettes too! Have a great weekend! Nice trays and such pretty displays. 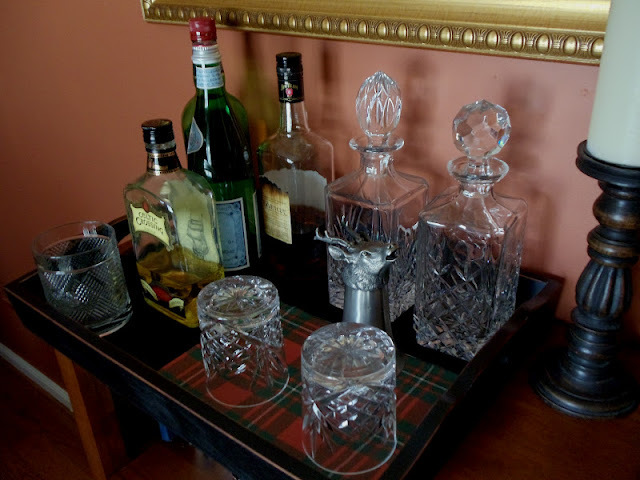 Love the drinks tray with the tartan. I love trays, too, Babs! They really "ground" a vignette. I love silver especially and am always on the lookout for them at the shops. I like your display with the reindeer moss and candle! I get so many cool ideas here! 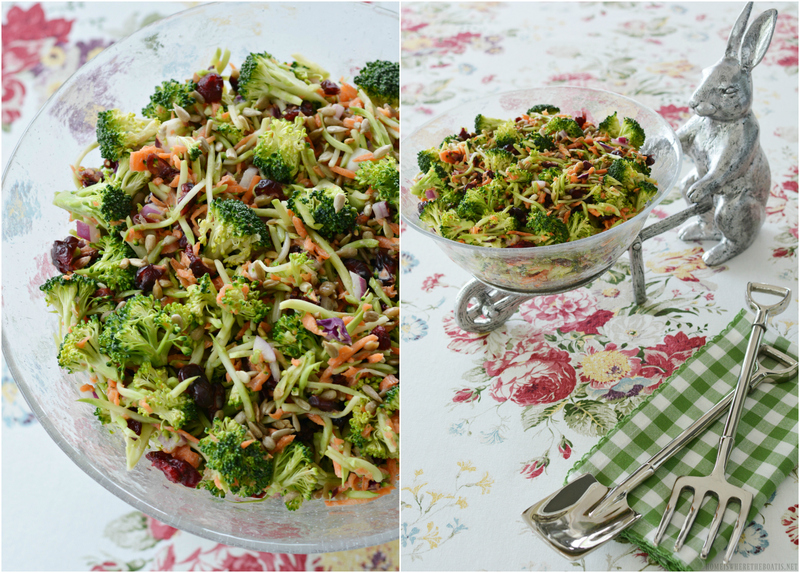 I love the trays and can't decide which I like best! I'm planning on redoing a bedroom and am thinking of using the taupe/turquoise. What is it about pretty soaps that are so appealing? problem is I would never use them and they would just get dusty! Babs, you have so many pretty trays and vignettes! I love how you display all of your pretty things! Babs, I'll have a cup of hot tea with you. Thanks! Hi Babs, so glad you dropped by! Madras shirts! That's what my husband talks about! What is a Blue Horse notebook? That's something I don't think I've ever heard of. What fun to remember! 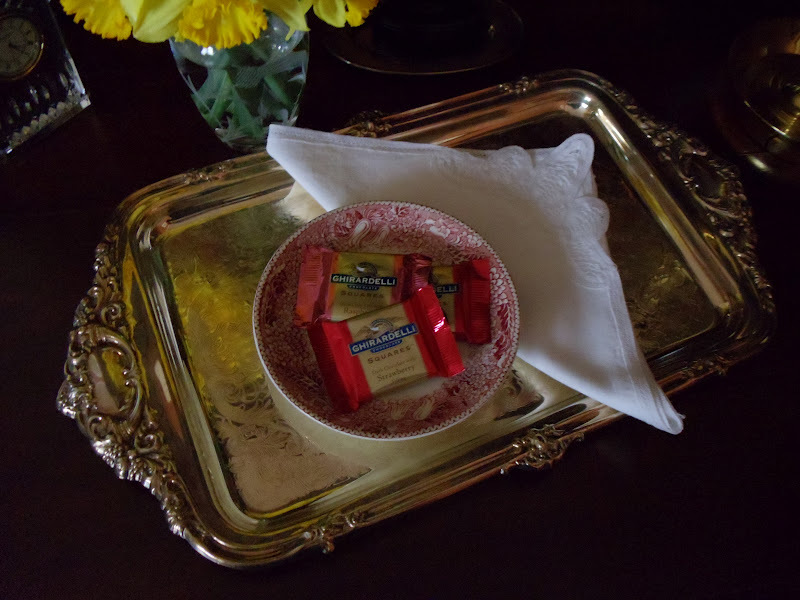 Your tray vignettes are just beautiful!!! 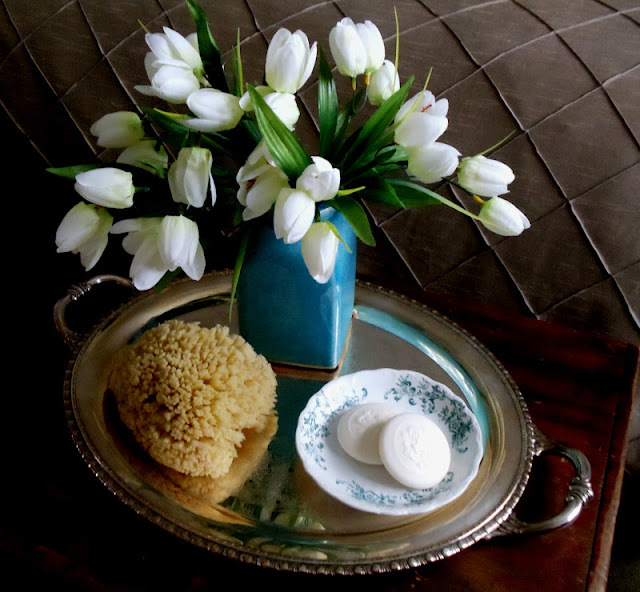 These tray vignettes are simply gorgeous! I can't pick a favorite! I love them all!!! Aqua and turquoise are showing often in my home decor catalogs...from pale to bold. Whatever hue you choose...it will be stunning, of that, I'm sure! Have a wonderful weekend! Your trays are all so pretty...the teal/turquoise caught my eye right away. It's in right now to! I am loving that color as well but I don't really have a place where I could work it in. It's really soothing. 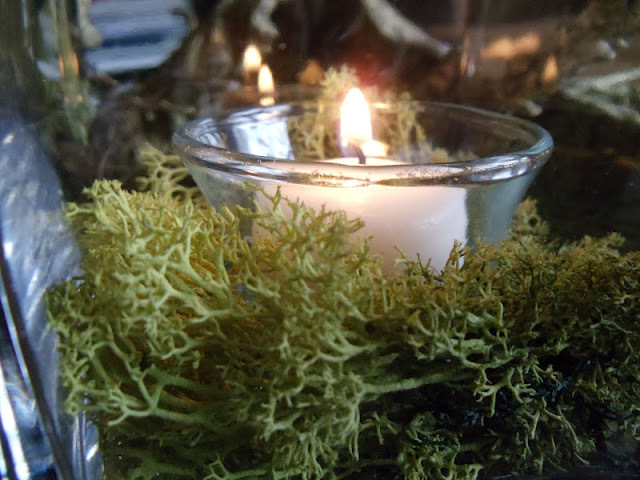 I love the vignettes you've created and I to love the reindeer moss. I just made up a bunch of topiaries for my shop with some. I love the two silver trays. I always keep my eyes open for them when antiquing and thrifting but none so far. I love all your silver trays...silver just seems to fit in anywhere! Very, very elegant. Love all of it. Lovely trays Babs. Love your vignettes too and I really love the turquoise. That plaid drink tray has my name all over it! Love it. All your trays are lovely. Can't wait to see what you end up doing to add some color to your master. Keep us posted, ok?!! Each of the trays and the vignettes are so pretty! Happy Valentine's Day! 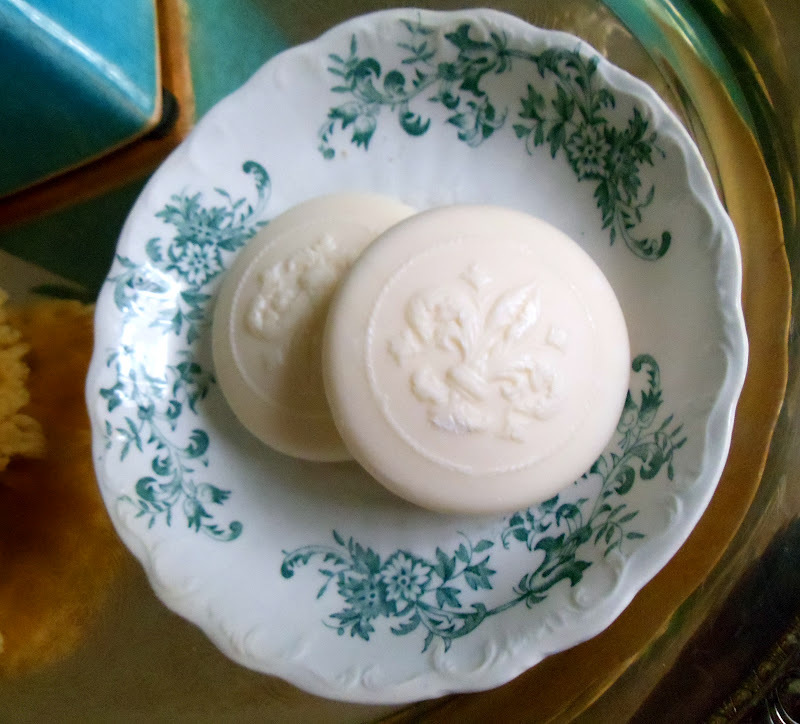 Love the turquoise addition to your tray, very pretty! Your natural elements are very beautiful, too! Oh, very nice! Thank you for joining me at Home Sweet Home! What wonderful vignettes. I love how you gather everything. I think that drinks tray looks pretty welcoming, Just needs a few cubes! The colors you're working on for your bath sound lovely. Your trays are lovely. How cool that you are styling right along with Pottery Barn having that bamboo tray!